Listen in as the director, assistant director and producer of a play called Winter discuss recent reviews and changes to the show. Producer: Have you seen the most recent reviews of Winter? People hate it right now. Director: Hate it? People just don't understand Winter. I really don't care what they think. Producer: They say it is too cold and there is too much snow. Director: But it's Winter. There's supposed to be snow and cold. People just don't understand. Assistant Director: I hate to interrupt this debate but we've got some problems over here on the set and we need the director to sort them out. Assistant Director: Well, for starters the snowdrops refuse to do their big bloom scene because they say they can't work under six inches of snow. Director: Tell them to hang on, it's going to get warmer in a few days and a lot of this snow should melt. When it does, we've got plans for a new scene for them. Assistant Director: I'll try to convince them..
Director: In the meantime, how about that Christmas Rose? Do you think we can coax it into blooming? Assistant Director: Uh, boss. The snow that is keeping the snowdrops from performing is crushing the Christmas Rose buds and they don't think they can go on at all. Director: I'm sorry to hear that. Let's strike their scene and move on to the crocuses. Producer: Sorry. We didn't sign the crocuses up for a play called Winter, so you'll have to wait a few weeks for them. Director: If I wait too long, this is going to be a play called Spring! Producer: Actually, given the poor reviews of the play called Winter, I think we could make some money if we pushed up the release date of a play called Spring. Think you can rush it a few weeks? Director: People around here wouldn't recognize a good season if it was an icicle that dripped on their head. I can't make any promises. There are a lot of blooms and birds and bees who need to rehearse before we can open a play called Spring. Producer: Well, see what you can do. I think people would really flock to a play called Spring if it means we've shut down the play called Winter. Assistant Director: In the meantime, boss, we've hired a pair of cardinals who think they can save the play called Winter. 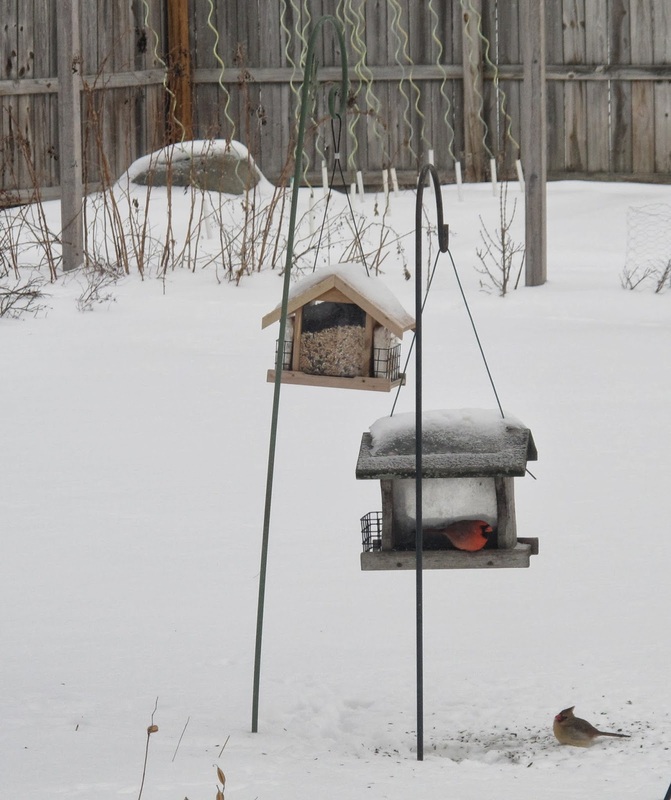 Though, they are insisting that we replenish the black-oil sunflower seed in the feeders, or they will leave. Director: I guess the cardinals are our last hope. Okay, fill the bird feeders, quiet on the set. Ready, set, action! The Katy version of a play called Winter doesn't involve snow, just a lot of gray skies and dead foliage. Enough! Very cute, but I've had it with winter. Nashville Audience member: Snow, what snow! I hope this play has a short run! Seriously, as much as I've complained about this winter, when I see how it's affecting parts of the country that aren't prepared for the cold and especially ice, I feel more sorry for them. We Midwesterners will survive this! Cardinals are wonderful! Why didn't I ever pay attention to them when I lived where THEY live? Meanwhile here we are just hoping for bit more rain. What a strange winter all around. The play called Winter is having a good run in the PNW. The audience used to rain and more rain was pretty intrigued, though unable to get to the theater very well in last week's snow and ice storm. Now we're back to good old Portland rain. Hellebores are completely unfazed. They seem to understand the play called Winter just about anywhere. Sorry to hear about your endless winter but cardinals! Wow! I wish we could have a few of those. Bring the curtain down now, on 'Winter', and let it raise on 'Spring'. 'Winter' has had a run which has been far too long!